BANNERMEN is a real-time strategy game developed by Pathos Interactive, set in the semi-fantasy medieval realm of Valtoria. Take on the role of a fallen lord on his journey back to become one of the mightiest in the realm. Make your banner strike fear into your opponents and challenge the multiplayer ladder in action packed skirmishes. Regain former bannermen that have surrendered to Lord Karthor. Terror spreads and forces ever greater sacrifices to hold Lord Karthor’s men at bay. Without a home and much time to spare, you must travel the vast lands of Valtoria to obtain supplies and convert soldiers to your righteous cause. Take manual control over each unit and use its abilities wisely. Manage your resources well and establish your bases strategically. Each map has unique nature powers, which are spells that can be cast to cause your enemy tremendous damage. Unlocking these nature powers is a constant struggle as you have to build and defend temples, which can only be erected in holy spots that are located on strategic positions on each map. You also have a hero unit under your command, which can be levelled up to become stronger and unlock powerful spells. 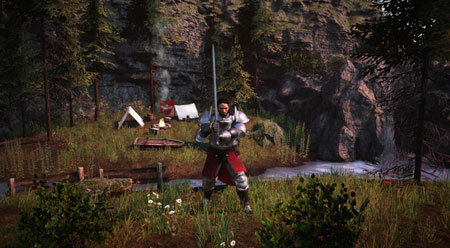 The game features a full-length singleplayer campaign, that lets you dive into the realm of Valtoria as its hero. Command troops, free prisoners, infiltrate strongholds, manage resources and construct buildings to achieve victory in the great war. Learn to fight in many vastly different environments; use sandstorms to hide your advance, set up traps against incoming attacks or blow up your enemies with an explosive barrel. If you get stuck in the game, check out the video walkthrough and gameplay for the game. This entry was posted in PC Games, Walkthrough and tagged BANNERMEN Cheats, BANNERMEN Gameplay, BANNERMEN Guide, BANNERMEN Strategy, BANNERMEN Tutorial, BANNERMEN Walkthrough by Marvin. Bookmark the permalink.